MOST STORIES HAVE two sides to be told, and the tale of Saint Petersburg and its football team is no different. Racism and bigotry have blighted the reputation of Zenit in recent years, with one of the most idiosyncratic and original fan groups in the country responsible for international outrage over their brazenly controversial proclamations. It could be argued that the relationship between them and the outside world is a microcosm of Russia’s global outlook; there is no single clear answer in the search for the identity of the club, just as the whole country is not simply an extension of Vladimir Putin’s awkward foreign policies. Three years ago, an infamous open letter was sent to the management at the Petrovsky Stadium from the Landscrona group demanding that the club not sign any black or homosexual players. Worldwide reaction was instantly and justifiably outraged by the statement, as writers, fans and clubs rounded on the ultras without hesitation. To western observers, and most Russian observers too, there could be no excusing such a horrific view. A few days later, Landscrona attempted to mitigate their stance by explaining that they were merely trying to defend what they held to be their strong city identity, but by then the mud had well and truly stuck. One must take a step back at this point and take in the city, the country and their history to understand how such a statement could have been made in the first place. It is unthinkable that similar sentiments could be broadcast in England today, but then the 20th century, in particular, saw completely different eras engulf either side of the Iron Curtain. The Soviet Union was a closed country for over 70 years, where freedom of speech, foreign travel and worldwide education was strictly controlled, whereas Western Europe began working towards the formation of the European Union after the Second World War. Throughout Russia’s thousand-year history, foreign aggressors such as Genghis Khan, Napoleon and Adolf Hitler had attempted to conquer the vast land, so a natural insularity and wariness of outsiders has developed in the Russian mentality. There is clearly no defence of the racist message of Landscrona’s manifesto, but it is worth remembering that only thirty years ago monkey chants and bananas were not uncommon sights at English grounds, and it was less than forty years ago when Laurie Cunningham became the first black player to represent the full England side. You could count on one hand the number of professional footballers who have publicly announced their homosexuality. In modern-day England, the rhetoric of Landscrona’s letter is of course racist and bigoted, but half a century ago the terraces of Stamford Bridge or Anfield might not have regarded the sentiments in quite the same way as today’s football community. What merits discussion is the insistence made in the second statement that players for a club ought to represent the city, the region and country, a point Jonathan Wilson made in The Guardian. “Let’s imagine fans of Sunderland … get together and hammer out a manifesto which they then post as an open letter to the club hierarchy,” he wrote in 2012 when discussing the Landscrona letter. “Among a number of points about the need for absolute commitment and an abhorrence of cheating, they suggest they would rather the club focus on local players. What is the identity of St. Petersburg then, if Landscrona claim it is central to their ethos? From the world-famous Hermitage Museum to the Marinskiy Theatre and St Isaac’s Cathedral, the 42 islands that make up the ‘Venice of the North’ are littered with shining beacons of imperial pomp and majesty. Despite the city’s relatively brief history since Peter the Great founded his “window to Europe” in 1703, it has attracted a reputation for cultivating and inspiring artistic minds that Russia’s progressive leader would have been proud of. In fact, the banks of the Neva River have a story to tell that goes back thousands of years; archaeological evidence of some of the earliest human life in Northern Europe has been found near the sight of the modern city. Seven centuries ago, Russian forces destroyed a Swedish settlement called Landskrona near the site of present-day St. Petersburg, after which Zenit’s ultras are named. Although the Swedes established another fort at the mouth of the Neva in 1611, it survived less than a century before Peter the Great’s magnificent capital was finally founded amid the murky marshland. 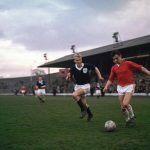 When stipulating the almost eugenic guidelines for preferred players to pull on the electric blue shirt, the manifesto accepted Scandinavians and those from the Baltic States as much as their own countrymen from outside north-west and central Russia. It is the groups they exclude from their ideal squad, though, that is most disturbing. “We are not racists, and for us the lack of black players at Zenit is only an important tradition, which emphasises the identity of the club and nothing more.” Such a clumsy and flawed statement – if a line is drawn between having black skin and being ‘eligible’ to represent Zenit, how can that not be considered racist? – would seem farcical if it were not for the magnitude of the topic. Revolutionary, cosmopolitan, artistic; or insular, guarded and bigoted? A gateway to the world, or a cauldron of xenophobia? As with most areas of Russian life, it is virtually impossible to pin down a concise but comprehensive identity of Russia’s second largest city, and the truth may unfortunately contain elements of both. 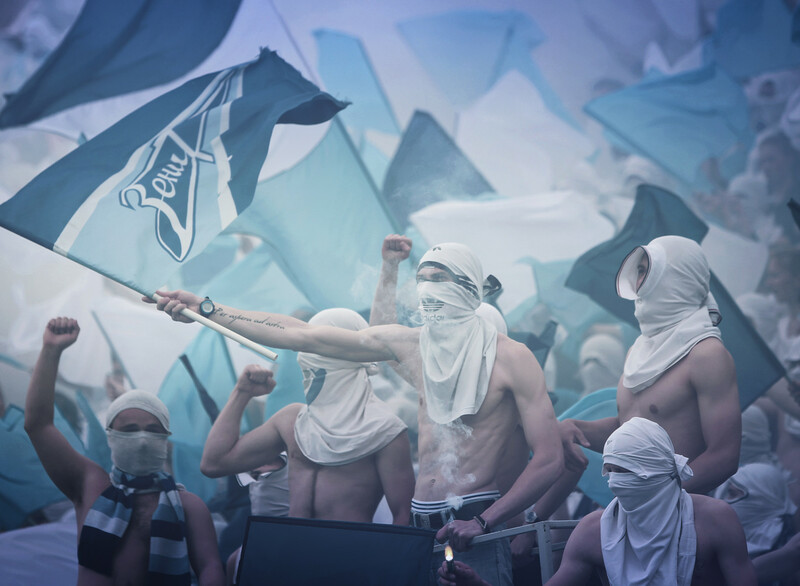 Banners stating “There is no black in Zenit’s colours”, shirtless fans wearing Ku Klux Klan headdresses and monkey chants have all made their ugly appearances in the Petrovsky stadium in the last decade, but what of the other aspect of Landscrona’s presence – support for their team? This antagonism is not confined to Landscrona and their Moscow contemporaries by any stretch of the imagination; people from the southern republics of Dagestan, where Anzhi are based, and Chechnya, home to Premier League side Terek Grozny, are regarded with thinly veiled disdain by many people across the country. Like many ultras, Landscrona are prone to releasing their passion through violence, and sometimes even worse. When they travelled 2,500 kilometres east to Siberia for a Russian Cup tie against then-third tier FC Tyumen last season, they resorted to setting fire to their stand and hurling flares at police as their multi-millionaire superstars were outplayed by their hosts in a shock 2-0 defeat. Ultras nowadays have to be more than just the toughest and most aggressive fans – their voices are becoming more and more relevant in the discussion about behaviour and attitudes, and with more global exposure than ever before, however much clubs may try to distance themselves from radical groups, they are instantly associated with the groups that lay claim to their name. 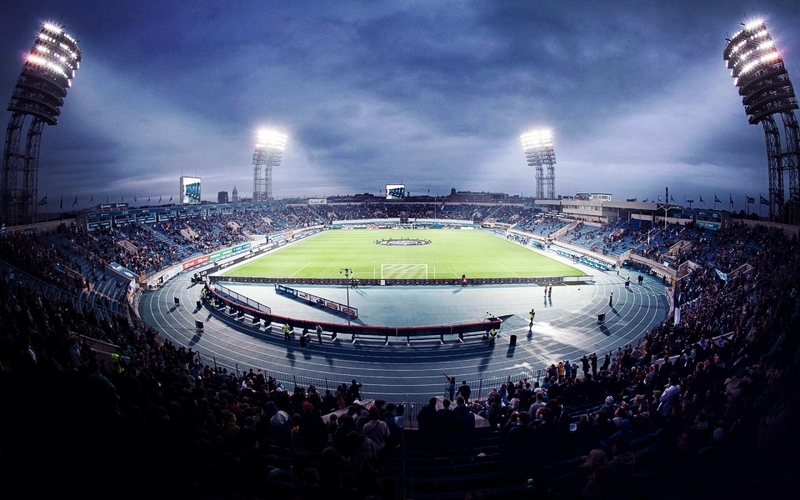 Zenit were thrust into the limelight by the heady combination of the Gazprom’s almost bottomless money pit and silverware, and it possible that Landscrona were just not prepared for the reaction they have received. It would be interesting to know what most of Landscrona’s members would think if they knew that one their city’s most famous sons, the legendary poet Alexander Pushkin, was directly descended from a black man. Pushkin’s great-grandfather was kidnapped from Africa and brought to Peter the Great’s court, where he gained favour with the Tsar and ended up as a governor in St. Petersburg. The real test of the strength of their beliefs over identity would be, as Jonathan Wilson points out, if a black player from the city was brought into the team.